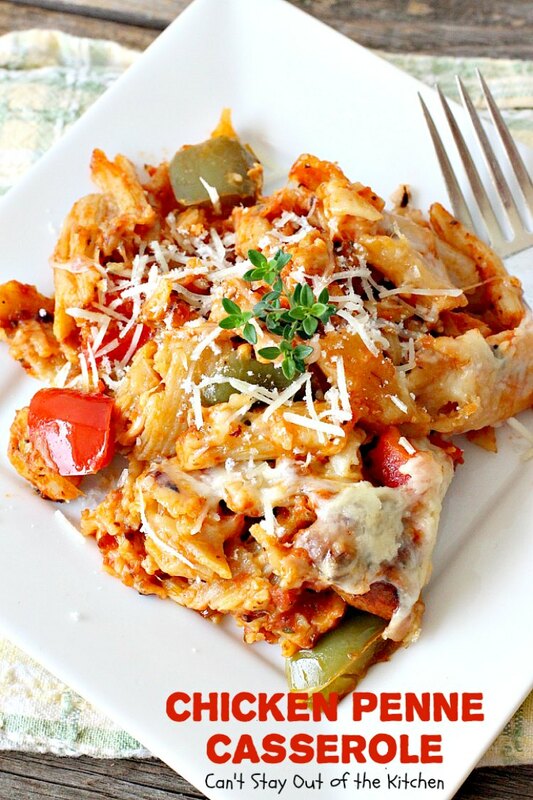 Chicken Penne Casserole is the ultimate Italian fare feast! This delicious casserole has a quick and easy sauce mixed with chicken, bell peppers, gluten free pasta and loads of cheese. 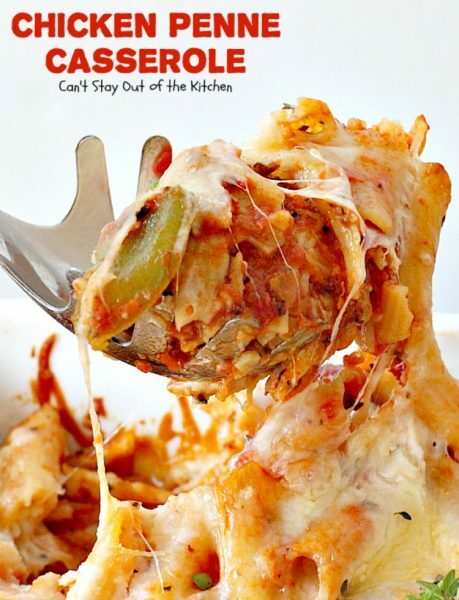 It’s double layered with the pasta and cheese between and on top of each layer. 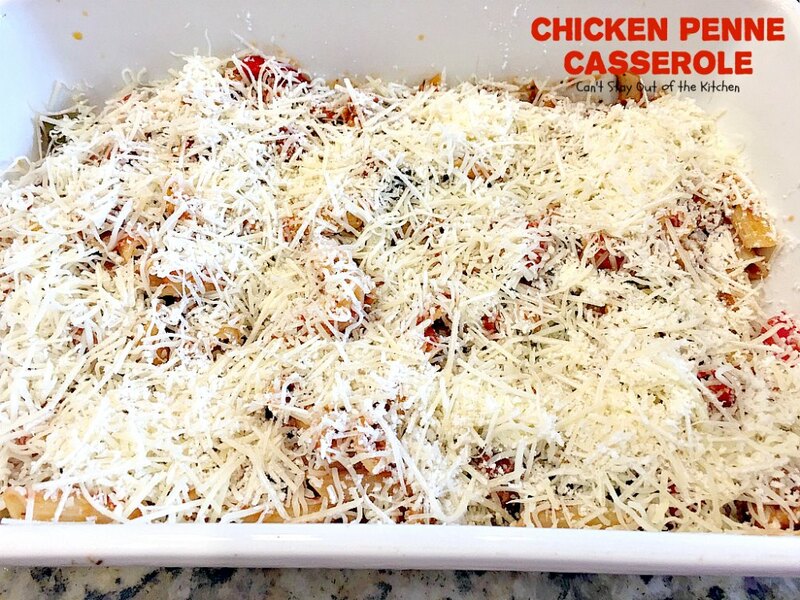 It’s so completely satisfying and delicious that it’s sure to become a family favorite. Yes, you heard right. 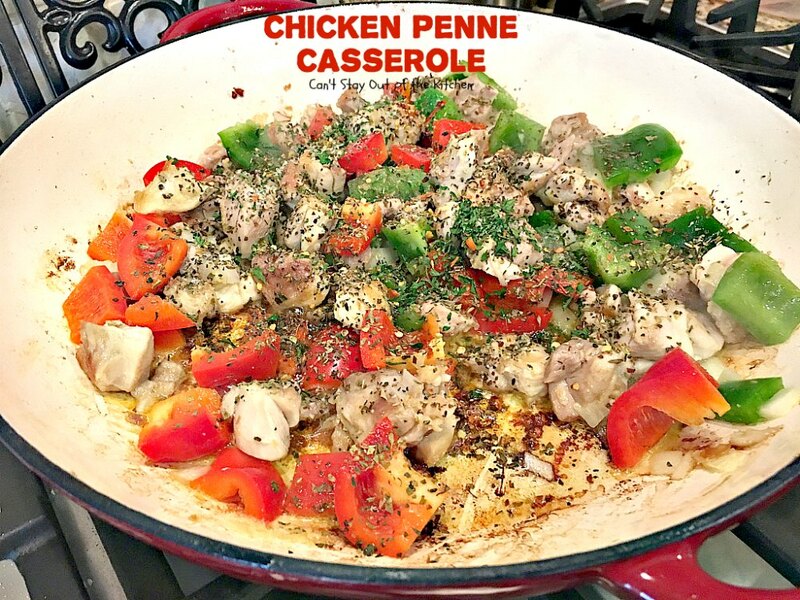 I made this dish with gluten free pasta! Make no mistake, some gluten free pastas are horrible. But Ronzoni makes one these days that’s terrific. 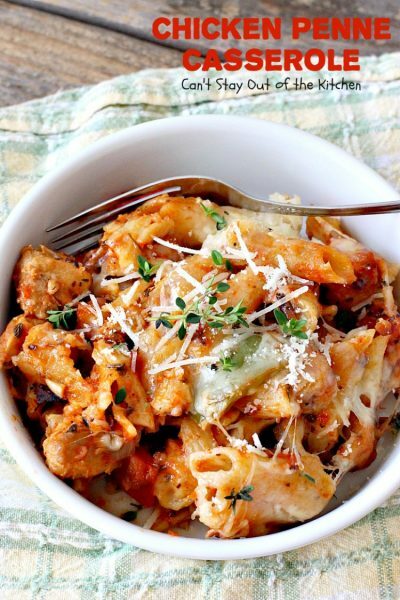 Most gluten free pastas are made with almost all rice or brown rice flour. They are so starchy that when you boil them the pot is filled with a silt-like substance after cooking. My husband humors me a lot, but he just can’t stand to eat most of those GF pastas. However, when I found the Ronzoni GF pasta last summer and tasted it, I was convinced. Better than that, my husband can’t hardly taste the difference so he will actually eat GF dishes made with Ronzoni pasta. A friend of ours from our church care group underwent gall bladder surgery last month. 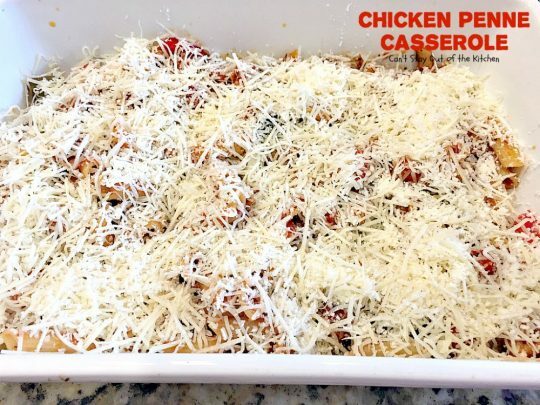 I made up a batch of this casserole for her family during her recovery. I also sent along a delicious Creamy Blackberry Salad and Almond Joy Blondies which were a big hit. 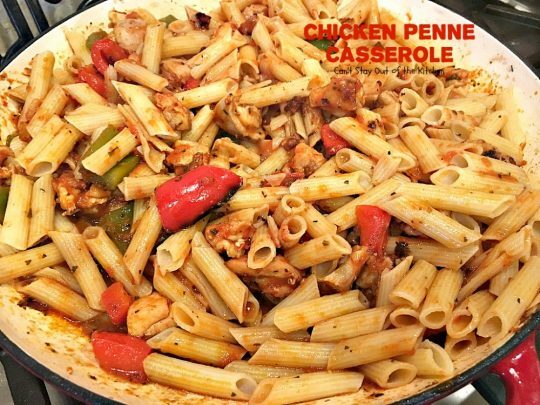 If you’re looking for a dynamite casserole to serve your family and friends, then Chicken Penne Casserole is scrumptious. 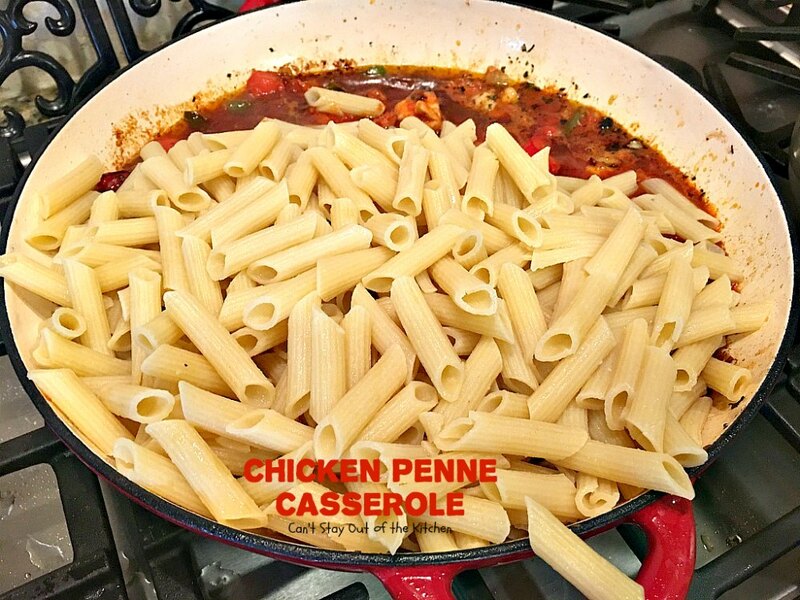 You can substitute regular penne pasta if you don’t have gluten intolerance, but it’s certainly delicious with the gluten free pasta. 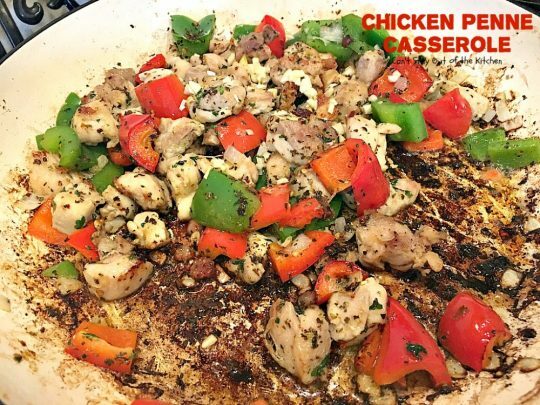 Prepare yourself for an explosion of flavor and comfort food extraordinaire. 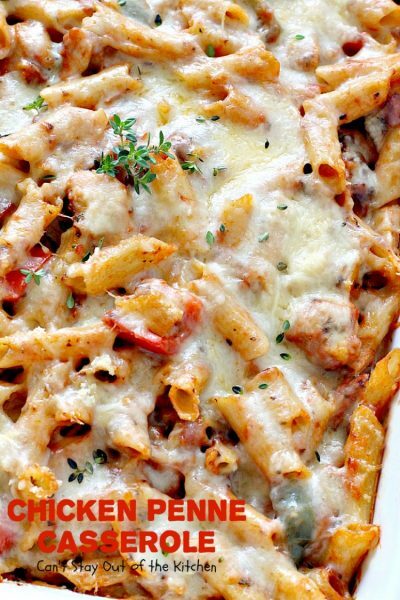 Chicken Penne Casserole is so hearty and satisfying. I used gluten free pasta, but regular pasta works as well. Chicken Penne Pasta is great to serve for company. I used these ingredients. I ended up using two different cheese blends because my Mozzarella cheese had gone bad. I used a 6-cheese Italian blend and a blend of romano-asiago-parmesan. 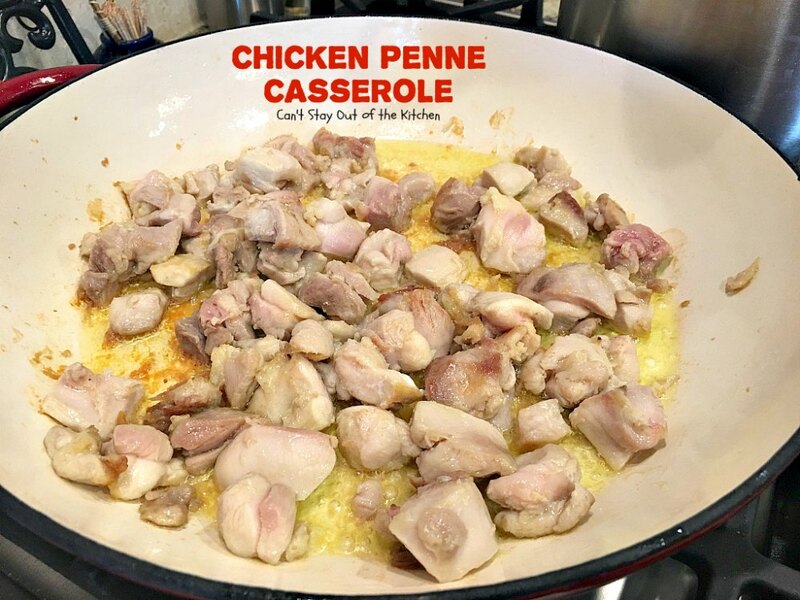 While I used chicken thighs, you can also use leftover rotisserie chicken if you desire. Add it in with the sauce ingredients later in the recipe. Place olive oil in a skillet over medium heat. 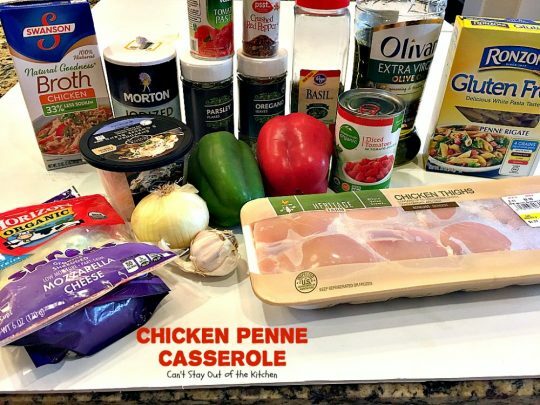 Add chicken. Saute about 5-7 minutes until chicken browns on all sides. (The chicken does not have to cook all the way through at this point). Add onions and bell peppers. 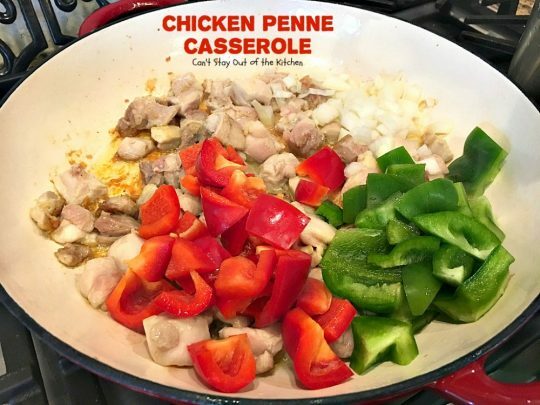 Saute until chicken is cooked through and opaque – about 8-10 minutes. Add garlic and saute about a minute until garlic is fragrant. Pulse tomatoes and tomato paste in a blender until smooth. I have a chopper option on my immersion blender that makes this really easy. Add pureed tomato mixture and chicken broth. Cover with lid. Reduce heat and simmer, covered, about 10-15 minutes until mixture has thickened. Meanwhile, cook pasta according to directions. Drain. Add drained, cooked penne pasta. Stir ingredients well to combine. Grease an 8×12″ glass baking dish. Pour half of the pasta mixture into prepared dish. Top with half of the cheeses. Spoon remaining pasta mixture over top of cheese layer. 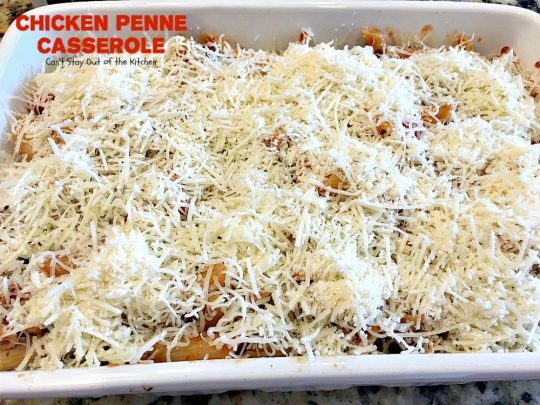 Sprinkle remaining cheeses over top of casserole. Cover with foil and bake about 30 minutes. 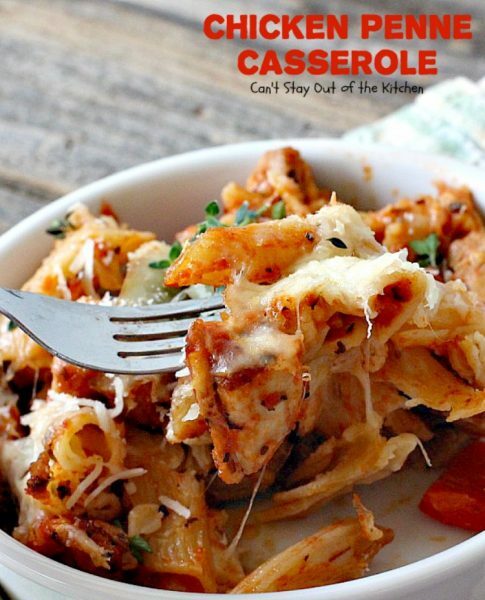 Remove foil and bake an additional 15 minutes until cheese is melted and casserole is bubbly. Garnish with fresh oregano if desired. This pasta is great served with your favorite salad and bread. 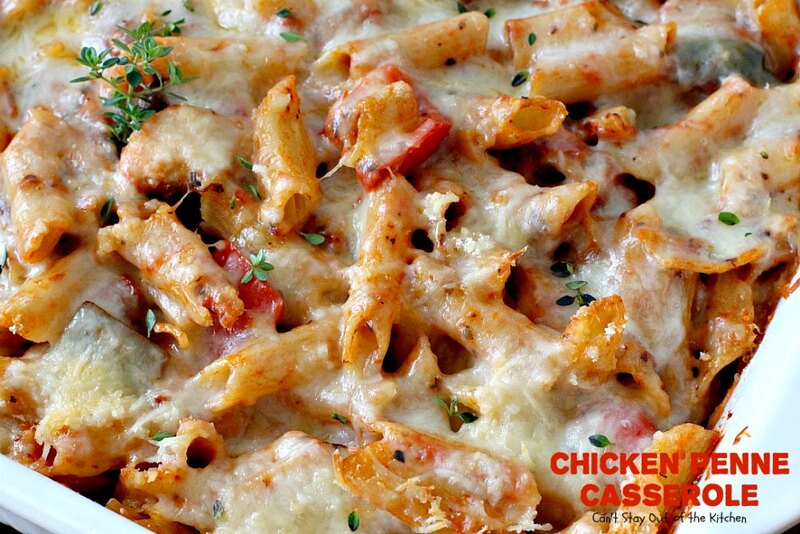 I served Chicken Penne Casserole garnished with extra cheese and fresh oregano. This cheesy casserole is the ultimate comfort food. 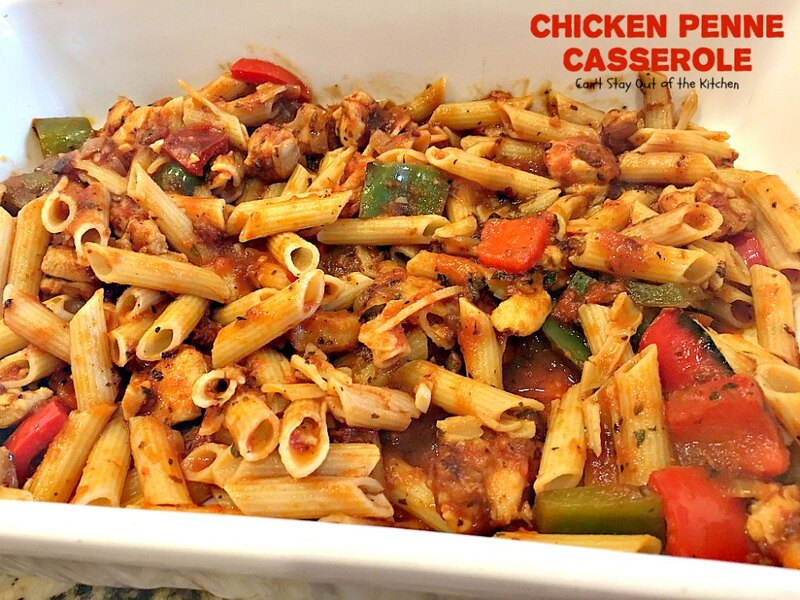 This amazing pasta dish is made with chicken instead of beef, a quick homemade sauce & gluten free penne pasta. It's also loaded with several cheese blends for a cheesy texture you'll love. Comfort food extraordinaire! Grease an 8x12” glass baking dish. Meanwhile, pour olive oil into a large skillet. Add chicken and sauté about 5-7 minutes, turning to brown on all sides. Add onion, bell peppers and seasonings and sauté until chicken is cooked through and opaque, about 8-10 minutes. Add garlic and sauté about a minute, until garlic is fragrant. 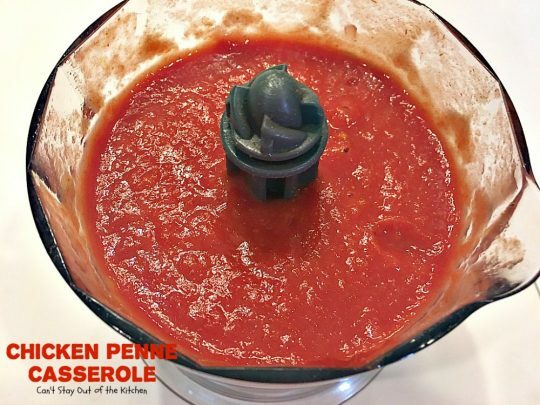 In a blender, pulse tomatoes and paste until pureed. 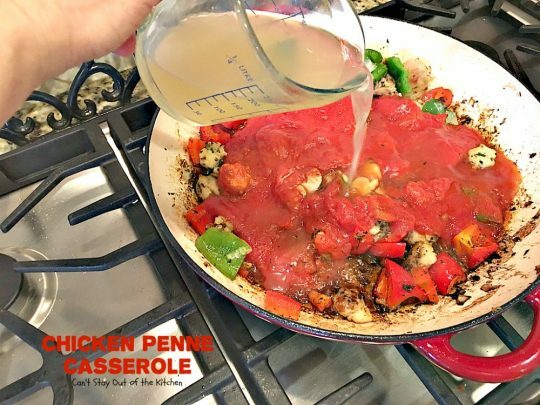 Add tomato mixture to chicken mixture in skillet. Cover with lid and simmer over reduced heat about 10-15 minutes, until mixture is thickened. 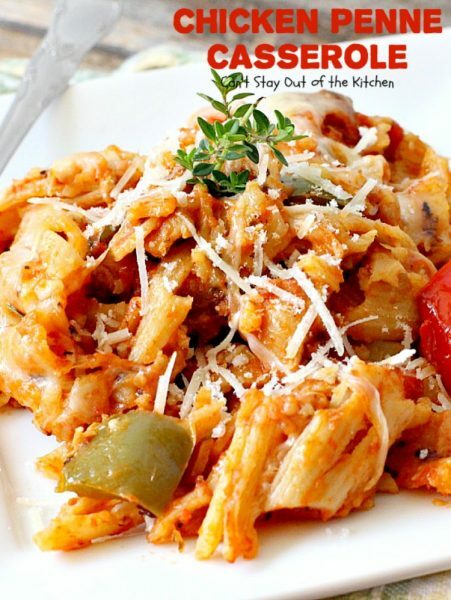 Drain pasta and toss with chicken mixture. Spread half of the pasta mixture into prepared baking dish. Sprinkle with half of the cheeses. 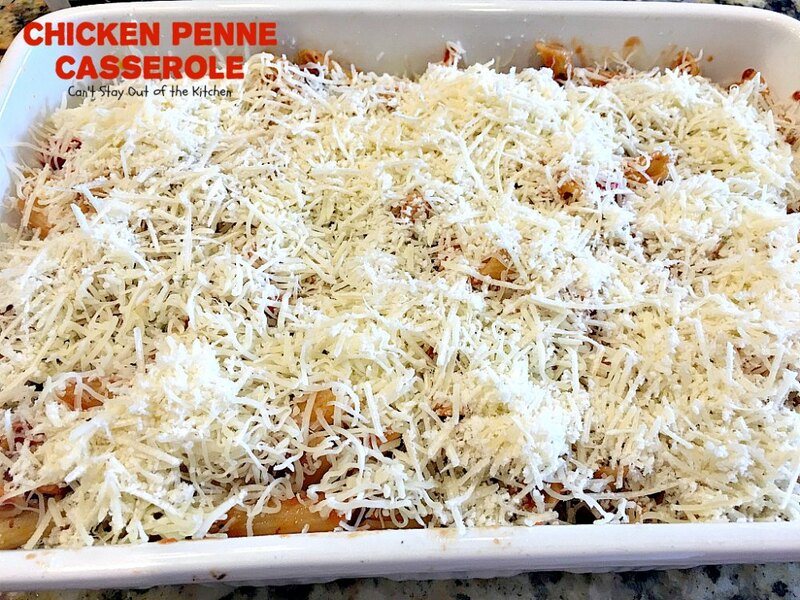 Spread remaining pasta mixture over top of cheese layer and top again with remaining cheeses. Cover with foil and bake about 30 minutes. Remove foil and bake an additional 15-20 minutes until casserole is heated through. 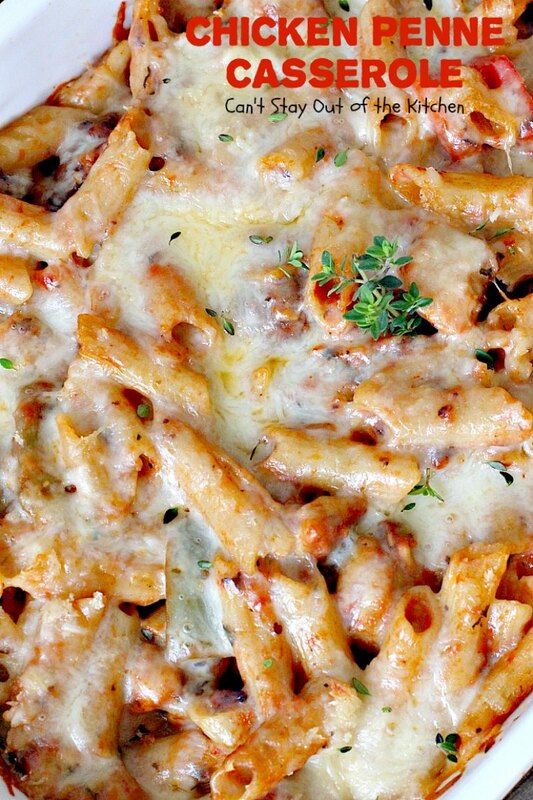 If desired, garnish with fresh oregano and additional cheese. Every bite of Chicken Penne Casserole is mouthwatering. I used a six-cheese blend along with a blended cheese of parmesan, asiago and romano. Yum. Yes, it’s LOADED with cheese! 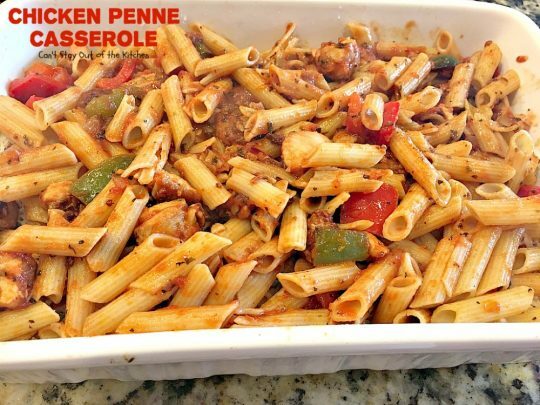 If you enjoy pasta but prefer an alternative to beef, than this is the casserole for you!